The CNE is one of my favourite times of year. Maybe that’s because I’m still a little kid at heart, or because I love spinning rides and the excuse to eat 2000 calorie fried foods. But it’s really because it feels like everything that is great about summer all rolled into one: long days spent outside with great friends in the sunshine, eating anything and everything you want, discount shopping at its best, entertainment in all its forms, and remembering how it feels to be truly alive via the risk you take letting your body be thrown around in metal contraptions controlled by teenagers working their first job (fair rides are truly the greatest adrenaline rush). This year though, the CNE moved into our digital future. The Food Building – aka half the reason we attend the CNE every year – got an app that allows you to skip the lineups and order your food ahead of time. Yes, that means you can be waiting in line for a ride, order what you want from your app, and walk back to the building just as it’s being prepared for you. 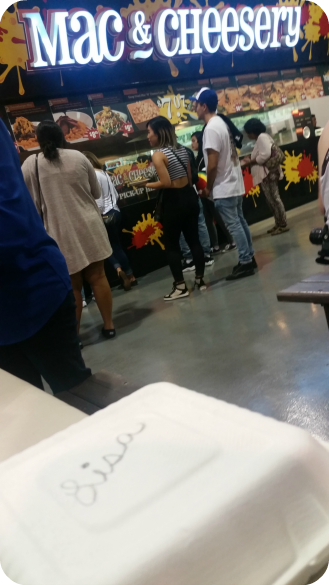 As we all know – because of the fanfare around the crazy foods at the Ex – the lineups can sometimes be insane in the Food Building, especially on a busy weekend around dinner time. 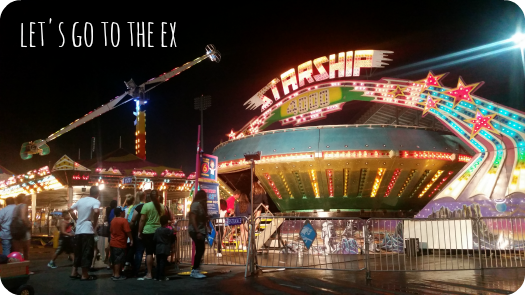 The ability to skip the line is exactly what the CNE has needed all these years. I loved that I was able to order while doing something else, and by the time I got to the booth in the Food Building, there it was, ready and waiting for me. You can download the CNE Food Building app now, and use it this weekend while you’re getting those last CNE moments in before summer says goodbye for another year. A couple things to keep in mind: it doesn’t have every item from each vendor listed (just specific ones); they charge a small service fee for every transaction; and if you use a gift card or a promo code – make sure you use it all at once or you will lose whatever funds you didn’t use. You also can’t order from 2 separate vendors at the same time – you have to go back in the app and process a separate transaction (which is to be expected, since you’re paying a different vendor). The one thing I hope they improve on it for next year is the options – while there was a nice variety of food choices available on the app, there were many more options in the building that were not on the app. Here’s hoping they can get everyone on board next year! To any food vendors unsure if the app is right for you – I can tell you right now – your customers want it, and it will definitely help increase sales when you have less people waiting in line. No one will turn away from your booth just because the line is too long, as I have done so many times in the past. As a bonafide TV buff, I like to think I’m quite knowledgeable on most of the great shows in television history. As a bonafide hater of sci-fi and aliens all my life – there is one series I always made a point of avoiding, despite being well aware of its important place in the entertainment canon. Growing up I was always watching something, but as soon as Star Trek came on I would flip the channel. I thought the aliens were hideously terrifying, and it didn’t make sense to me that the humans and aliens cavorted together. As a child I hated anything alien related, though. The thought of life on other planets seemed like the scariest thing imaginable. I remember literally crying at a friends house when she forced me to watch Independence Day. Then I met my boyfriend – who happens to be a true blue sci-fi nerd (he literally wore a vintage Star Trek tee on our first date). As it goes when you fall for someone, you start to open the more closed parts of your mind to things you might have previously wrote off, in order to see things through their eyes. I’ve now watched Alien, Aliens, Prometheus, Terminator, and now even Star Trek. 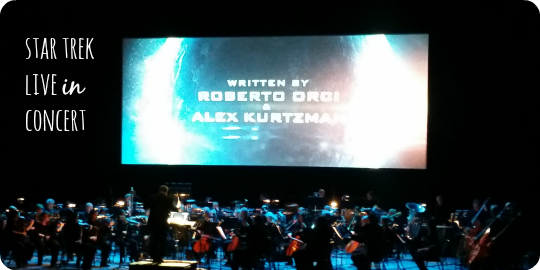 I actually had the chance to catch the 2009 movie revamp of Star Trek recently at the Sony Centre, where the Kitchener-Waterloo Symphony masterfully played composer Michael Giacchino’s epic score live. I’ve wrote before about how incredible it is to watch a movie with the score being performed live in front of you, and this experience was just as beautiful. Last time though, it was a film I had watched countless times, so I was able to pay more attention to the musicians onstage since I always knew what was about to happen onscreen. This time, being so completely new to the Star Trek world – for most of the screening I almost forgot they were even there – which is a testament to the level of musicianship conductor Erik Ochsner and his team excel at, as well as a testament to the film storyline itself being so strong and compelling. Would I have loved it as much if I were watching the original with Shatner and Nimoy? I’m not so sure. I actually sat down to watch the original movie over Easter and fell asleep – so I can’t claim I found it quite as compelling. But the revamp was shot with the same adrenaline and humour as modern day action adventure films like The Avengers, so it impressed me in a way I wasn’t quite expecting. With Leonard Nimoy’s recent passing before the screening, they also used the night as a tribute to the legend, and it was nice to see the Sony Centre screens lit up with his iconic moments as the night came to an end. I finally understand exactly why the fans love Spock so much. Star Trek Live In Concert is currently touring cities across North America, find the schedule here. Last week, I did something I normally loathe doing – I woke up and was out the door before 8am. I have never been, and quite likely never will be, a morning person. Normally, you’d be hard pressed to find me awake at that hour unless it’s for something specifically related to a job, but this time it was for the sake of shoes. Spa treatments and shoes. Skechers knows how to create a morning worth waking up extra early for. The spring summer 2015 preview of the new line of Skechers took place at Elmwood Spa – the definition of a high end, luxury spa that is worth paying a premium for. Upon arriving, I was asked if I would like a foot massage and then treated to a delicious breakfast spread – is there any better way to start a morning than this? I think the world would be filled with happy people if everyone got to start their day with happy feet. After my toes were exfoliated and relaxed, I entered the showroom where we all got a good look at the massive variety of shoes Skechers currently produces. Admittedly, the last time I owned Skechers was probably grade 8, but back in those days I absolutely adored this brand. You were the cool kid at school if you were lucky enough to have a pair. 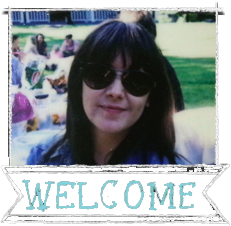 I specifically remember my beloved baby blue chunky foam wedges, my first pair of heeled shoes – I had lusted after them for a while before my parents agreed to buy them for me. I wore them so much that summer that they were grey once fall came around and it was time to start wearing boring shoes again. While it has been over a decade since I last owned a pair, that is because I had always associated them with running shoes once I outgrew the girls style shoes I had once adored – and sneakers aren’t a type of shoe I wear unless I’m in a gym – AKA never. But I quickly found out just how expansive the brand has become. While comfortable sneakers for women are obviously their main appeal, they have boot styles that I would happily purchase, and shoes suitable for work – but much more comfortable than the typical dress shoe. AKA I want all of these. I was lucky enough to take home a pair of their rainbow Skech-Knit Mesh Flex Appeal Memory Foam sneakers as seen above, and man, if I knew running shoes could look this cool and feel this comfortable I might not have had an aversion to wearing them on my walks and while running errands. The knit idea allows them to be incredibly comfortable – you know how typical athletic shoes don’t really allow your feet to move, and then the leather ends up cracking where your foot bends when you actually do run in them? These will never give you that problem. It also allows them to come in amazing colours and patterns that you would otherwise never see on a shoe. And can we talk about the idea of built-in memory foam insoles? YES please. I don’t know why this concept doesn’t exist with every shoe that is ever made. It’s essentially a custom insole for your foot – and if you struggle with foot pain as much as I do you’ll understand just how valuable that is. The knit shoes (and most of their other styles) are also sleeker than most running shoes, they fit closer to your foot, weigh very little, and don’t look bulky on. They’re the perfect shoe to wear to yoga and pilates class – I’ve always struggled with what to wear with my lulus on the way to classes because regular running shoes make you look like bigfoot when you’re wearing tights, and nice shoes look odd with athletic wear. These are the perfect solution. 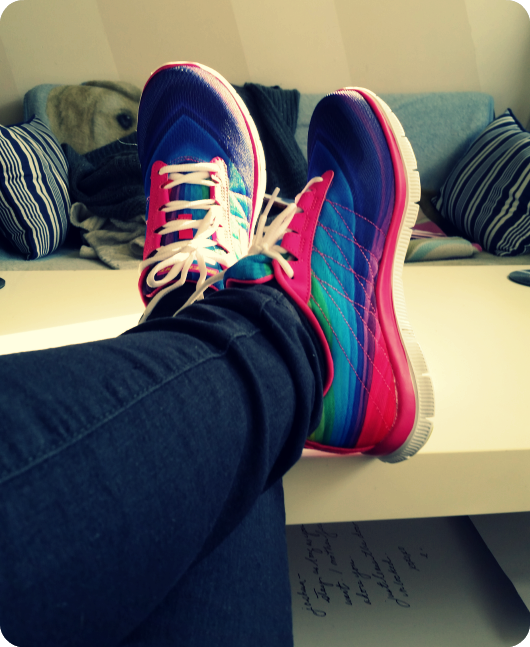 It’s safe to say I am happily back on the Skechers train after a 15 year hiatus. While I didn’t travel so far this year that I needed to board a plane, I still managed to get my wanderlust fix in by taking a bunch of road trips across Ontario. There is really nothing I love more than a good road trip. My favourite people, my favourite music, some snacks and a good vehicle are all that is required for a memorable mini-vacation on a whim. Thanks to Honda, I was able to try a handful of different cars for weekend getaways throughout 2014, and I’d love to take you through the ones I found particularly great for road tripping. As seen above with my man, the Accord is the perfect practical car. I had the chance to test it out in Niagara, and you can read more about that trip and how much I loved the car over on Dose. While I didn’t use the Acura for a Bonnaroo trip, I couldn’t help but think that it would be absolutely perfect for that situation when I was testing it out. Back when my friends and I drove down to Tennessee for the festival, we were in a small economy rental – and with all our stuff packed in – it was not particularly comfortable. Not to mention that the heat in Tennessee in June is unbearable, so sitting in the vehicle for shade/sleep (since the tent was unbearably hot) was something we all needed to take turns doing. The Acura is an incredible vehicle for a variety of reasons, but its spaciousness would definitely come in handy in such a situation. You can take the seats down for extra room should you need to sleep in it. Plus, the dvd player setup in the back will keep your friends entertained over the very long drive, and the navigation system will make sure you don’t get lost trying to find the farm. And the surround sound audio and SiriusXM mean you’ll be able to sing your heart out the whole drive down. I was able to test out the Civic on my way to go parasailing for the first time in Grand Bend. This short trip might be the highlight of my travels in 2014 because not only had I never parasailed before, but I had never been to the adorable beach town that is Grand Bend before. Parasailing is unlike anything I’ve ever experienced. Ziplining in Victoria is probably the only thing I can compare it to. But somehow parasailing was scarier, even though it only lasted about five minutes. I probably shouldn’t have googled parasailing accidents before I went – but knowing something has a risk is half the fun of doing it, right? It was truly one of the most spectacular views I’ve ever witnessed in my life. I wish Grand Bend was closer, as I would be there every weekend in the summer if I could. The Civic might be my favourite car of them all. If I was going to buy a car today, I’d probably be going with a Honda Civic. It is beautifully made, gorgeous to look at, great on gas, and has all the incredible features I’ve come to expect from Honda – push start, rear camera, voice navigation, incredible audio, lane watch, and I don’t even have to fish through my purse to find the keys – it detects them and unlocks automatically when I approach. I had a chance to try out the Fit while participating in my first drumming lesson. Yes, I finally fulfilled my childhood dream of learning to drum! Well, maybe not fulfilled, but I almost learned how to play Sweet Home Alabama well enough that I wasn’t completely ruining the song. See me awkwardly taking my first few hits in the video above! The Fit is cool for a a few reasons – one being it’s price point is super reasonable for a new car. Another being that you can literally fit almost anything in it, despite it being a small car. As you saw, we were able to fit a bass drum in it – which I wasn’t even expecting would actually work. You can use it as a 4 seat when you want to grab your friends for an impromptu trip to Montreal, or as a 2 seater when you want to pack your life in the car and see where the road takes you. The Accord Hybrid has everything I already loved about the Accord, but is also extremely efficient on gas – I spent a total of $30 over 4 days of heavy highway driving, compared to the $60 to $80+ I would usually spend on much less driving. If everyone that drives would be able to switch to a Hybrid, the world would be a cleaner place, and people would suffer less rage from exorbitant gas prices. The only thing better than a Hybrid is the electric car – and I hear Honda is working on some models as we speak. On another note, Honda is doing something truly important this holiday season. Help them donate $20,000 to the Make-A-Wish Foundation by donating. For every dollar you contribute – they contribute another dollar. It’s the time of year to give, and this is a great way to make your contribution go twice as far. There’s no doubt I’m what you might call a late shopper. While I usually know what I want to give someone far ahead of time, I tend to wait until the last minute to actually do the shopping or creating involved. Admittedly I’m a fan of working under pressure, but doing that during the holidays is a special kind of nightmare. Pressure is great on my own while working on something in my home, but as soon as I have to deal with legions of other people invading my personal space to get their hands on the exact item I’m looking at, I get a little crazy. Introverts should always shop from home. 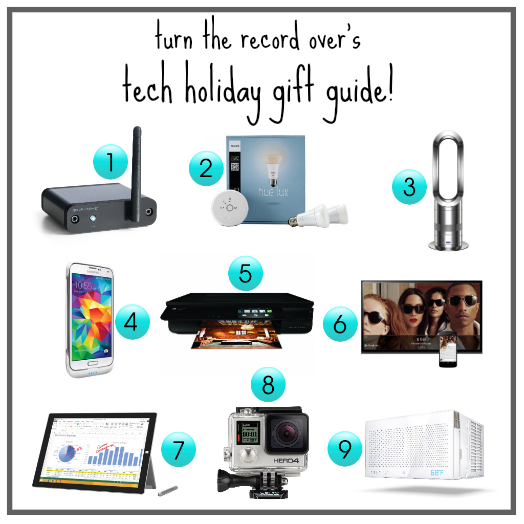 With Christmas just over two weeks away, if you (like me) haven’t started shopping yet, I have a few suggestions on what to get that person in your life who is obsessed with the convenience modern technology gives to our everyday lives. I love this item because it allows your badass turntable speaker setup to also be used to play music wirelessly from your phone or computer. When you just want to blast that new Beyonce track you don’t own on vinyl, this is an awesome option to have. It allows you to ditch the wireless speaker and go straight to your super awesome, super expensive speakers. Did I mention how much I love convenience? Controlling my television through my phone has been one of the simple pleasures of my life, and being able to do the same with my lighting would be a joy. If you too want to make your phone the most useful item you own, this is a nice item to have. This makes the cut because, living in a very old apartment in Canada means I deal with two things year round – it’s either too hot, or too cold. It would be amazing to have one item that supplements the heat in the winter, and helps cool in the summer. I currently have a space heater and three fans that take up space in my small apartment – this could replace them all. Living in a big city means you’re not exactly rolling in extra storage space – for that reason, this is a great gift. The one complaint I hear from literally all my friends is that their phone’s battery dies far too soon. Many of us use it so frequently that it burns out before we can get to the end of the night, sadly missing out on so many great instagram opportunities. This case from Mobile Fun has saved me from experiencing that feeling since I encased my phone in it way back in August. Bonus, as I have the Samsung Galaxy S5, which is super lightweight compared to my previous S3, and the case added the bulk I needed to stop accidentally dropping it all the time! While printing almost seems outdated and wasteful in this world of the cloud, printing is always a nice option to have. Being a writer, I am constantly printing and signing contracts, and I always seem to forget to remove the printer cord from my laptop before walking away with it – therefore taking the printer with me on a journey to its smashed up death on the floor. It’s definitely time for a wireless printer, and this one that looks stylish + prints my photos with frame-worthy clarity is an extra bonus. I was given one of these to try out back when Google launched their music streaming service back in May, and I’ve been in love with it ever since. Previously I had been attaching an HDMI cord to my laptop to project movie and tv show streams onto my TV, now I just control it all wirelessly through my phone – so much easier! The only downfall is that it doesn’t work on uhh, less than legal streams you might find on certain websites – but it’s perfect for Netflix, CraveTV, YouTube and even for music – it seamlessly connects to Rdio and Songza so I can blast a playlist through my TV. While you all know how much I love my ASUS Transformer – and I definitely recommend it as a gift for your coffee shop loving friends this holiday season – if you’re looking to really impress someone this season, the Surface Pro 3 is an even more substantial offer. I watched my artist boyfriend create a drawing on it in no time with ease. That’s not something any old tablet can do. For the creative person in your life, the Surface Pro 3 is a winner. You can also check out Intel’s guide to the perfect tablet for anyone in your life. I had the chance to use a GoPro back when I was sent to Victoria BC for Rock The Shores. To say I’ve wanted one ever since would be an understatement. The ability to capture high quality video in a camera that small, and that waterproof and durable, is a major win. The travel and adventure lover on your list wants this, guaranteed. As mentioned above, temperature control in my very old building is non-existent. There is no built in AC in my apartment, so every time May comes around, my top floor 1 bedroom is a boiling overheated mess. The crappy $75 window AC I bought the first summer I moved in over 6 years ago has most definitely seen its last days, and this ‘smart’ AC looks magical with all its settings and controls! Of course, it’s a present that won’t get to be used until the warmer months come, but it’s something people living in Toronto tend to rely on once the sun comes back – so they will still be grateful for it. This post was sponsored by Intel Canada. While the tablet was gifted to me for review, all opinions and product recommendations are my own!